In honor of Valentine's Day I wanted to show all my followers some LOVE so I will be posting a FREEBIE everyday until February 14th! The daily freebie will be posted for only 24 hours so you need to follow my blog and store so you don't miss out! Today's FREEBIE is my favorite Valentine project! I wanted to share this freebie first because they make a GORGEOUS February bulletin board. 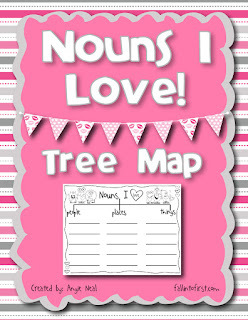 Students will use the tree map to write 5 people they love, 5 places they love, and 5 things they love. 5 Places I LOVE - Starbucks, Cheesecake Factory, Pizza Hut (I am on a post-pregnancy diet), the gym, school. 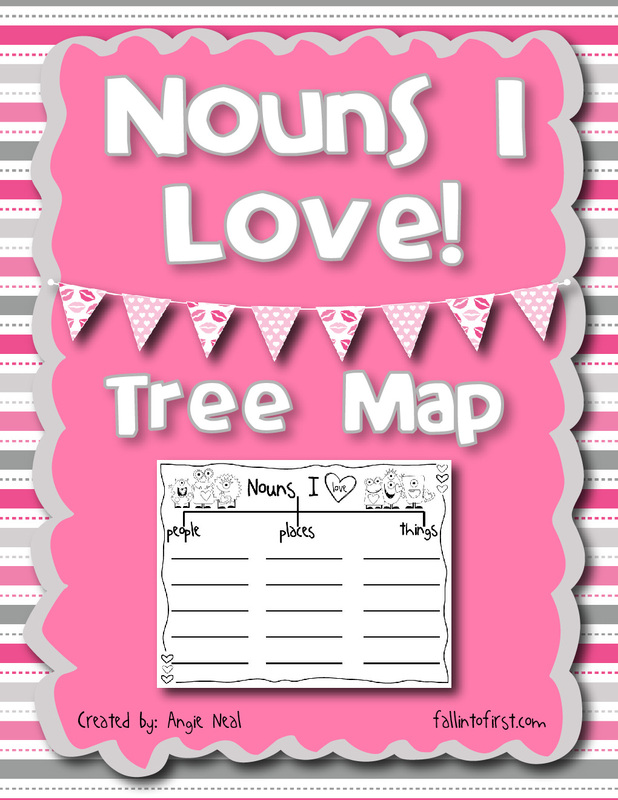 After completing their tree map, I gave students the heart template provided and they divided their heart into sections to write all of their nouns in. The middle heart is reserved for their name (I had to blur that part out). Then students used watercolors to paint each section of their heart and when their art was dry we traced it with a black marker and VOILA a beautiful display! This item will be posted for FREE until Saturday, February 2nd. Come by tomorrow for the next FREEBIE! I love this activity! I pinned it last year, and have been eagerly anticipating it for awhile! Any tips on how you got your kids to draw the right number of evenly spaced lines to make their hearts look so nice? I am glad this is something you can use in your class! I just modeled on my example for the kids how to make the spaces the right size and most did great. I had a few that struggled but they looked so neat when they were all hanging because they all looked so different. I wish I had more pics to share. 0816jejeAir Jordan chaussures chaussures nike femme asos ont non seulement dominé le domaine de l'athlétisme maintenant, mais asics chaussures de running gel noosa tri 10 ils ont également développé de plus en plus nike air jordan 1 grey populaire de la planète des chansons. Premièrement, Hyperfuse, bien basket nike air huarache femme sûr, n'avait pas de technologie flywire, elle chaussures nike air max homme 2017 est principalement faite d'hyperfuse. Ainsi, pour cette équipe, un certain asics cumulus pas cher nombre de membres seront probablement obligés de air jordan 1 mid rouge se sacrifier pour que l'équipe ait un moment commun pour basket nike tn requin 2016 interagir.